Tynda (Russian: Ты́нда) is a town in Amur Oblast, Russia, located 568 kilometers (353 mi) northwest of Blagoveshchensk. It is an important railway junction, informally referred to as the capital of the Baikal-Amur Mainline. Its population has declined sharply in recent years: 36,275 (2010 Census); 40,094 (2002 Census); 61,996 (1989 Census). The name is of Evenk origin and is roughly translated as "on the river bank". The town is located at an elevation of 500 meters (1,600 ft) above sea level, near where the Getkan joins the Tynda River, after which the town was named. The Tynda then flows into the Gilyuy, a tributary of the Zeya, a few kilometers east of the town. The settlement of Shkaruby was founded in 1917 on the present site of Tynda, as a rest stop and winter camp on the route from the Amur to the newly discovered gold fields on the Timpton River, a tributary of the Aldan. In 1928, in conjunction with construction of the highway to Yakutsk, it was renamed Tyndinsky (Ты́ндинский). In 1932, plans for what would eventually become the Baikal-Amur Mainline (BAM) named Tynda as a possible future hub station. A 180-kilometer (110 mi) long rail line, connecting Tynda with BAM station (known as Bamovskaya) near Skovorodino on the Trans-Siberian Railway was constructed between 1933 and 1937, although this was then dismantled during World War II and the rails reused for other projects closer to the front. In 1941, Tynda was granted urban-type settlement status. The revival of the construction of the BAM as an All-Union Komsomol Project in the early 1970s saw the reconstruction of the rail line between Bamovskaya and Tyndinsky, followed by the construction of the BAM east and west of the town. The settlement and its hub station were placed under the patronage of Komsomol brigades from Moscow, befitting its status as symbolic capital of the BAM. As its population grew due to the construction, the settlement was granted town status and received its present name on November 14, 1975. The full extent of the BAM opened for full use in 1989, with the exception of the Severomuysky Tunnel. Tynda went into a decline after the BAM was completed, as the utilization of the mainline turned out to be low. Tynda's population has dropped by over 30% since the dissolution of the Soviet Union, from a high of 61,996 inhabitants recorded in the 1989 Soviet Census, to an estimated population of around 38,000 in 2008. Tynda has a subarctic climate (Köppen climate classification Dwc) with severely cold, rather dry winters and warm, very rainy summers. Within the framework of administrative divisions, Tynda serves as the administrative center of Tyndinsky District, even though it is not a part of it. 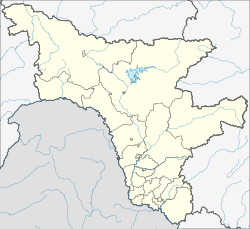 As an administrative division, it is incorporated separately as Tynda Urban Okrug—an administrative unit with the status equal to that of the districts. As a municipal division, this administrative unit also has urban okrug status. Russians, Ukrainians, and Belarusians make up the majority of the town's population. Around 1,500 North Korean loggers worked in the region as of 2007, strictly prohibited from speaking with journalists and residing in isolated camps which are closed to all other people. Tynda is the crossing point for the Baikal-Amur Mainline and Amur Yakutsk Mainline railways, the town's station is one of the most important on both lines and possesses a large locomotive depot. Other than railway-related activities, the town's economy relies largely on the timber industry, with the Tyndales corporation based here. The M56 motorway to Yakutsk also passes through the town. The town is served by the Tynda Airport, located 15 kilometers (9.3 mi) to the north. After being closed for a number of years, air services from Blagoveshchensk via Zeya resumed in 2007. ^ "In pictures: Siberian showcase's decline". BBC. July 27, 2007. Retrieved December 27, 2009. ^ "Bagdarin, Russia". Retrieved January 19, 2013. Амурский областной Совет народных депутатов. Закон №127-ОЗ от 23 декабря 2005 г. «О порядке решения вопросов административно-территориального устройства Амурской области», в ред. Закона №272-ОЗ от 11 ноября 2013 г. «О внесении изменений в Закон Амурской области "О порядке решения вопросов административно-территориального устройства Амурской области"». Вступил в силу со дня первого официального опубликования, за исключением подпункта "б" пункта 2 статьи 7, вступающего в силу с 1 января 2006 г. Опубликован: "Амурская правда", №11, 24 января 2006 г. (Amur Oblast Council of People's Deputies. Law #127-OZ of December 23, 2005 On the Procedures of Handling the Issues of the Administrative and Territorial Structure of Amur Oblast, as amended by the Law #272-OZ of November 11, 2013 On Amending the Law of Amur Oblast "On the Procedures of Handling the Issues of the Administrative and Territorial Structure of Amur Oblast". Effective as of the day of the first official publication, with the exception of subitem "b" of item 2 of Article 7, which is effective January 1, 2006.). Амурский областной Совет народных депутатов. Закон №414-ОЗ от 19 января 2005 г. «О наделении муниципального образования города Тында статусом городского округа и об установлении его границ», в ред. Закона №100-ОЗ от 5 декабря 2005 г «Об образовании Беленького сельсовета в Тындинском районе и внесении изменений в отдельные Законы области по вопросам административно-территориального устройства области». Вступил в силу по истечении десяти дней со дня первого официального опубликования. Опубликован: "Амурская правда", №19–20, 26 января 2005 г. (Amur Oblast Council of People's Deputies. Law #414-OZ of January 19, 2005 On Granting the Municipal Formation of the Town of Tynda the Urban Okrug Status and on Establishing Its Borders, as amended by the Law #100-OZ of December 5, 2005 On Establishing Belenky Selsoviet in Tyndinsky District and on Amending Several Laws of the Oblast on the Administrative-Territorial Structure of the Oblast. Effective as of the day after ten days from the day of the first official publication have passed.). Амурский областной Совет народных депутатов. Закон №32-ОЗ от 3 августа 2005 г. «Об установлении границ и наделении соответствующим статусом муниципального образования Тындинского района и муниципальных образований в его составе», в ред. Закона №100-ОЗ от 5 декабря 2005 г «Об образовании Беленького сельсовета в Тындинском районе и внесении изменений в отдельные Законы области по вопросам административно-территориального устройства области». Вступил в силу со дня первого официального опубликования. Опубликован: "Амурская правда", №166, 24 августа 2005 г. (Amur Oblast Council of People's Deputies. Law #32-OZ of August 3, 2005 On Establishing the Borders of and Granting a Corresponding Municipal Formation Status to Tyndinsky District and to the Municipal Formations It Comprises, as amended by the Law #100-OZ of December 5, 2005 On the Establishment of Belenky Selsoviet in Tyndinsky District and on Amending Several Laws of the Oblast on the Administrative-Territorial Structure of the Oblast. Effective as of the day of the first official publication.). This page was last edited on 8 April 2019, at 00:55 (UTC).